Today not only is Polaris open for business, it has been expanded since I first visited 18 months ago. Within months after opening United found they had a winner on its hands (go figure). The Polaris lounges are wildly popular and for good reason. 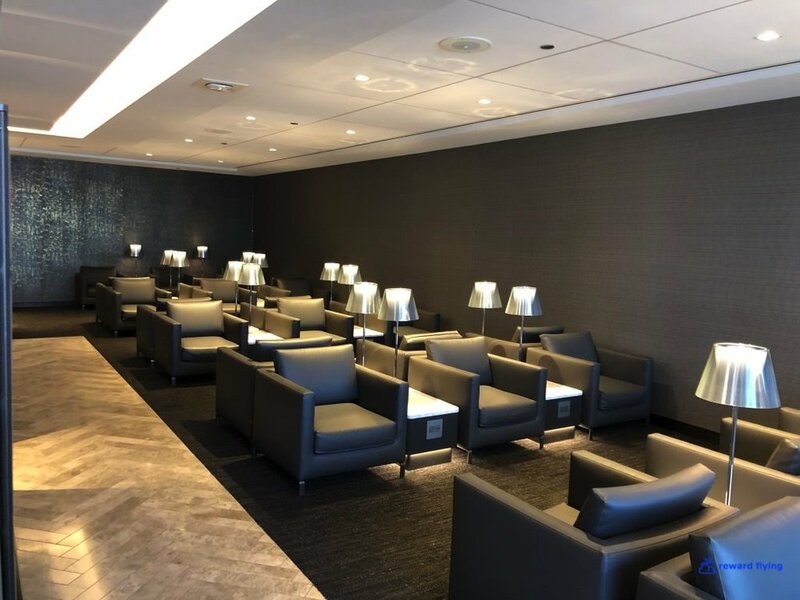 They are comfortable, have private seating, are nicely decorated, with excellent food from either the buffet or with table service and you can rest in one of the private resting rooms as well as use the private showers and restroom facilities. 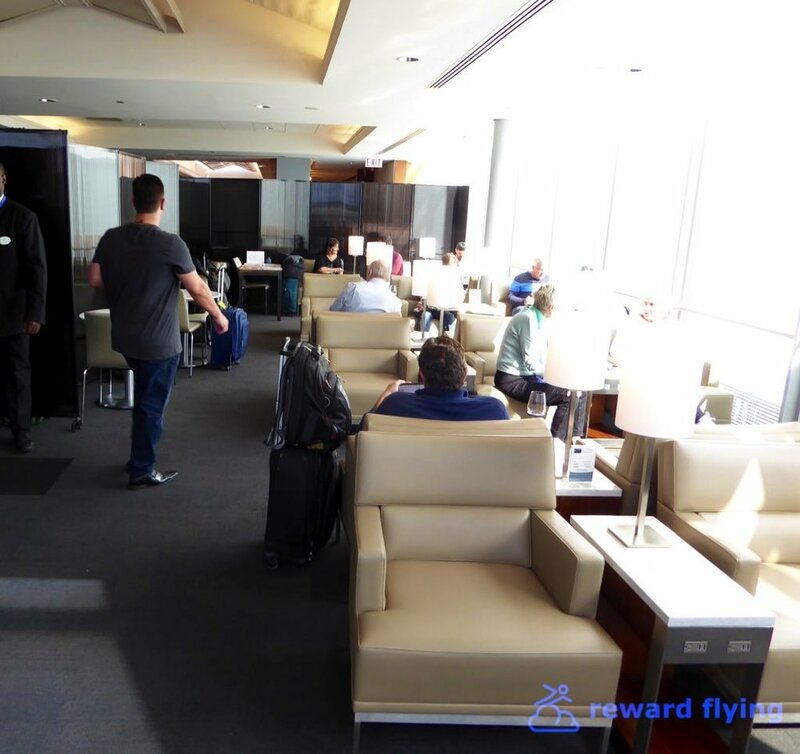 The lounge is located next to gate C18 which is in the middle of C concourse when you get off the tunnel escalator originating from B concourse. 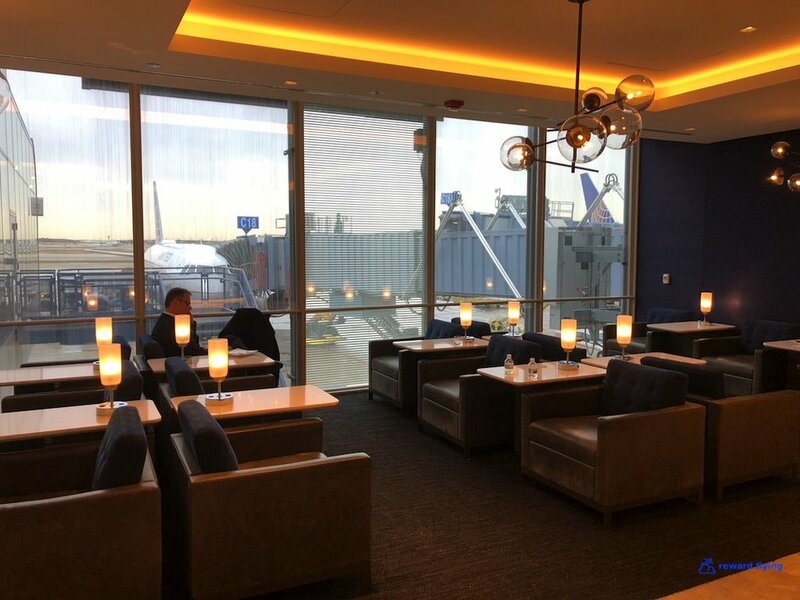 When opened ORD had sit down dining arranged around the bar. There weren’t many tables available back then. 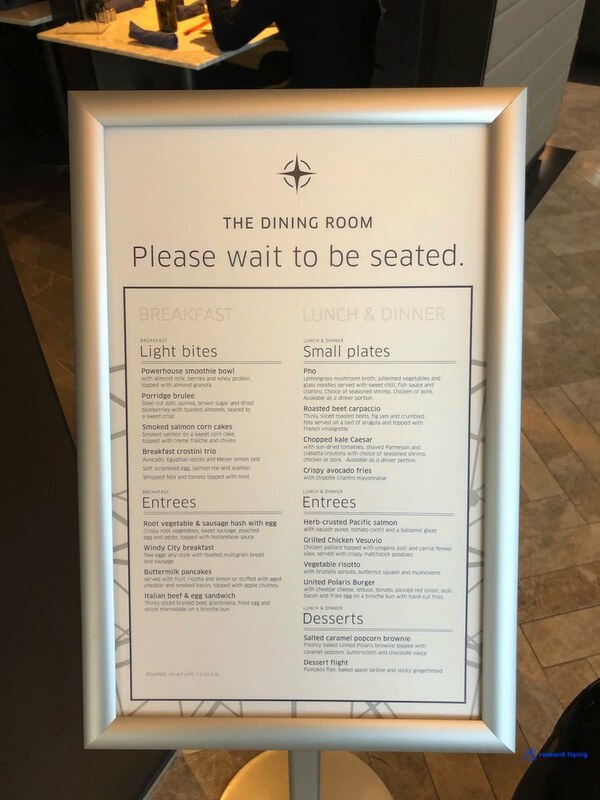 So the expansion not only added more lounge seating, they created a separate dining area. This new dining area adds 9 tables. Parallel to the dining room are more seats. There are also some seats along the windows. These 2 photos essentially make up the addition to the existing club. Fortunately for me I was in the lounge at a slow time, my flight was 4:15 pm and the bank of outbound European flights doesn’t get into high gear until after 6PM. 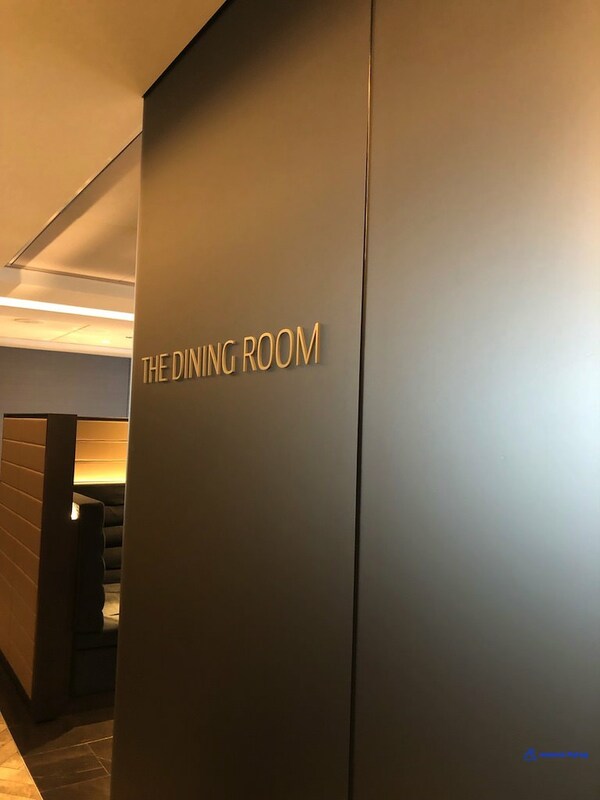 If you want to have a sit down meal in this lounge come early is my only recommendation. And you know, it’s worth it. Why not start early? Generous too. Anticipating a feast on ANA111 I chose the Vegetable Risotto. It was fabulous. A brownie on a menu is like a bone on a dog’s menu. I want it. A beautiful dessert, and delicious too. The buffet had some interesting food items available as well. No it wasn’t me who attacked the brownie tray. I sat with a cup of coffee waiting for Star Wars. to the gate. I tried to get a nice photo of Star Wars BB-8 but this is the best I could do. Even a clear shot would have been disappointing considering the condition of these windows. A better opportunity presented itself upon arrival in Tokyo. 1545 it was. Apparently this traveler was allowed early boarding and decided to take a jump seat. 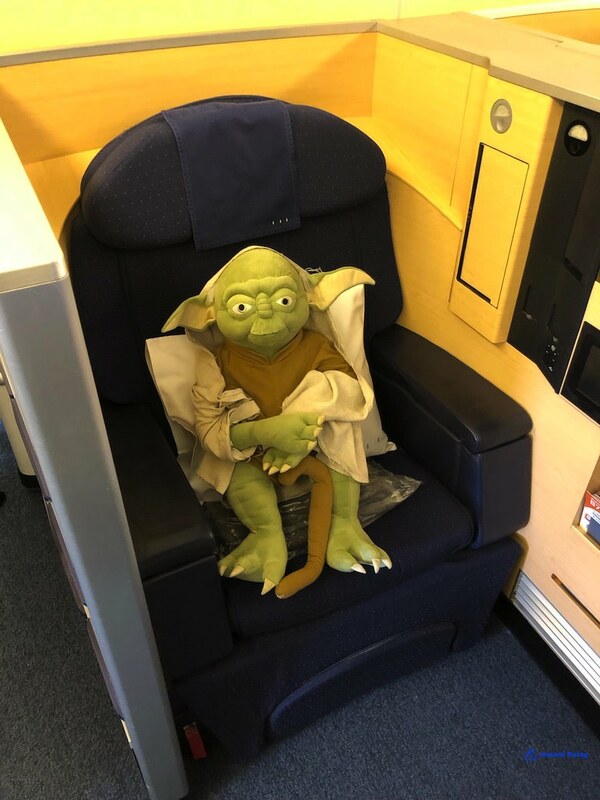 Soon after I got settled I was joined in the cabin by Mr. Yoda. Which prompted this tweet. 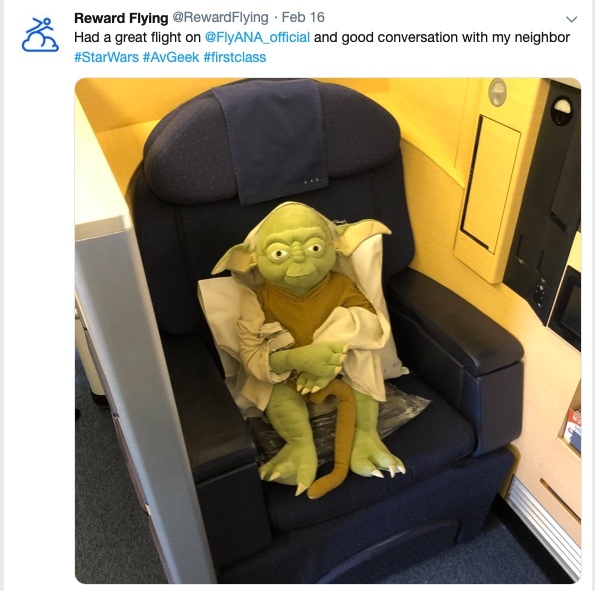 Not only was Yoda present on this flight, the boarding music was Star Wars theme and the Flight Attendants wore Star Wars smocks. The Square as it’s called has plenty of storage. In addition to overhead bins, underneath the ottoman you can stow your computer bag / purse. I also noticed this tray which had escaped me before. It’s very narrow. 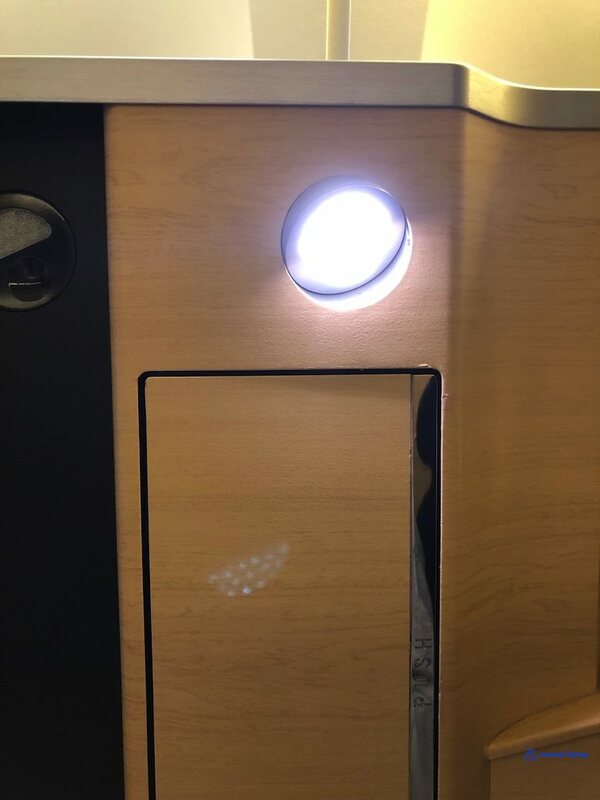 My biggest complaint with this First Class suite are the fairly useless little cubby compartments that cover up the window. Although the IFE controller locked in place makes changing channels easier and you can watch yourself do it. The biggest issue I have is with this beautifully large monitor is it’s antiquated and very difficult to see now that HD has become the norm. In fact I had to stop watching a movie because I couldn’t see it as many of the scenes were at night. First order of amenity, a box of chocolates. 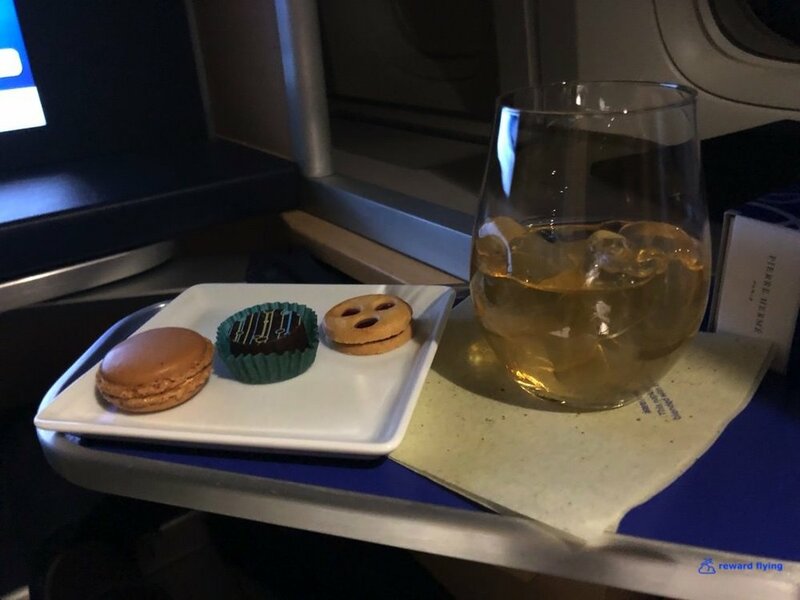 Along with the pass around basket of inflight amenities such as combs, toothpaste, body sheets (whatever they are), at the seat was a hard shell ANA Amenity Kit, new style very comfy ANA pjs, and Sony Headphones that were excellent. I went to the standard size 777 (meaning small) lavatory to change. ANA has a plate that is lowered down in front of the toilet presumably so you can stand on something sanitary when changing clothes. Notice the basin color. I returned in time to view ANA’s new safety video. This entertaining video goes back to the Edo period and uses characters from the Kabuki theater. In fact they are portions of the video that were performed by actors from the current play Sugawara Denju Tenarai Kagami. Time to go. Bye-bye ORD. Shortly after departure, Mickey the lead Flight Attendant came rushing over and pointed out the window asking if I could see the rainbow. I hadn’t, pretty cool. Mickey and the other FA Sueshuke were very good attendants. Not the best as I had to constantly ask for water and they didn’t to the over top things like make the bed in a different Suite (there was no one in row 2 after Mr. Yoda moved on), but they were great anyway. It’s time for ANA to shine. How many airlines greet you with this first page in the menu binder? 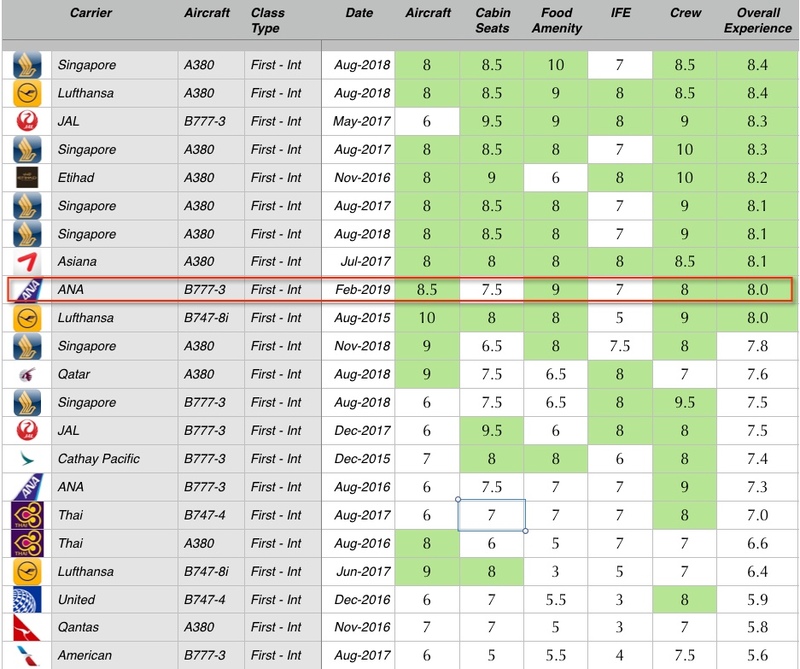 Typically I like to sample the native fare when traveling on Asian airlines (others too). But today the Japanese Cuisine didn’t cause any excitement. I didn’t know what alfonsino was. Turns out the next meal in business class out of Haneda had this fish alfonsino. I loved it. Next time. My first glance at the International Cuisine menu was the “from Japan” page where Wagu beef was being served. Yes! Then I corrected my mistake turning to the “from USA” page only to have a plain old filet of beef as the bovine served heading west. As luck would have it, 2 of the 3 appetizers contained items that I either can’t have or don’t care for, leaving little to decide, not that much was in question from the beginning. Sueshuke outdid herself with this setup and presentation. 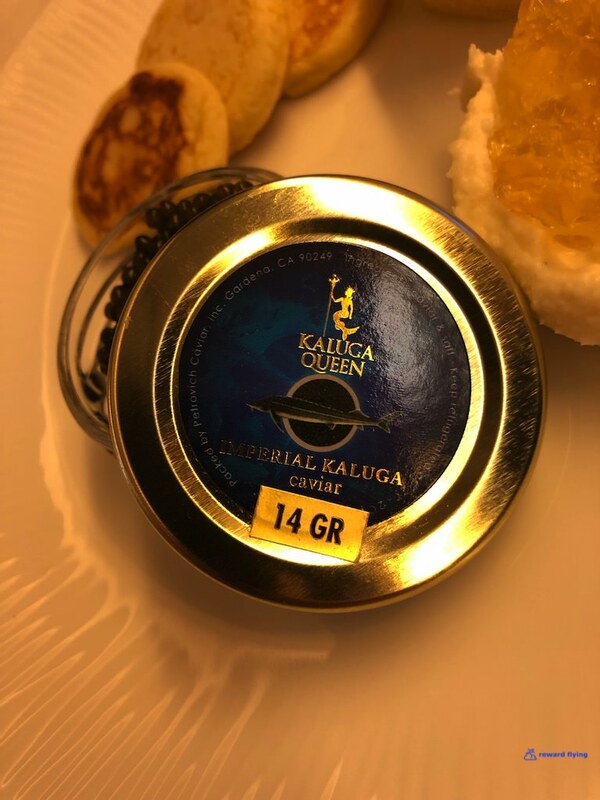 In an interesting twist this was not so traditional caviar presentation as evidenced by the lack of onion, egg, etc. The caviar was accompanied by something called a Parsnip mousse. The different textures is what stood out, creamy and gelatinous finished with the saltiness from the caviar. It was really, really good. Sueshuke cleared the empty plate and set up for soup and salad. Next was the Corn Soup. SoCalNow had raved about this soup on his last ANA trip so I was anxious to try it. He was correct about the rich corn flavor for sure. This bowl however was very thin, almost watery. It didn’t have any consistency. But as you can see the Krug is still going strong. Everything was very good but I was having remorse for not ordering the Washoku as it’s so much more interesting and I’m sure Sueshuke would have allowed me to have the Caviar. 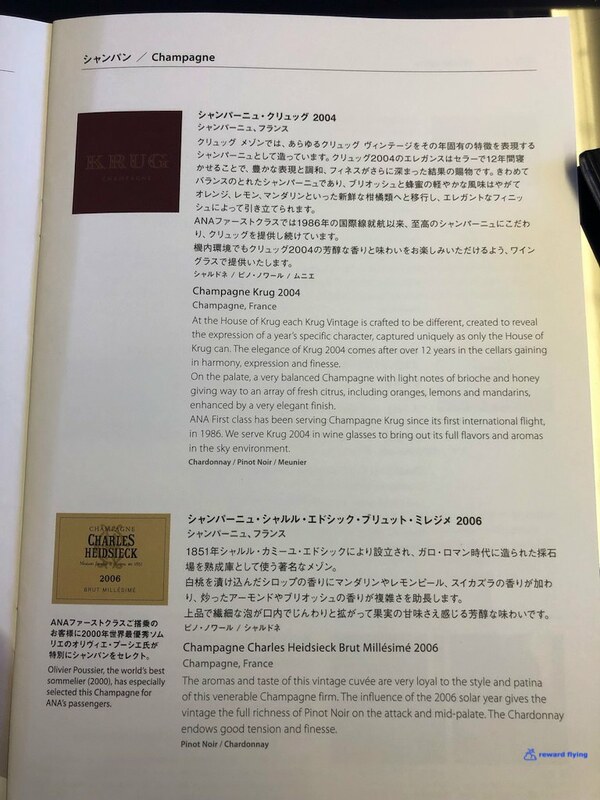 But I didn’t and it’s time to say goodbye to Krug and head to red wine menu. What’s this? A United States Washington State red wine as your best First Class red? And a blend no less? 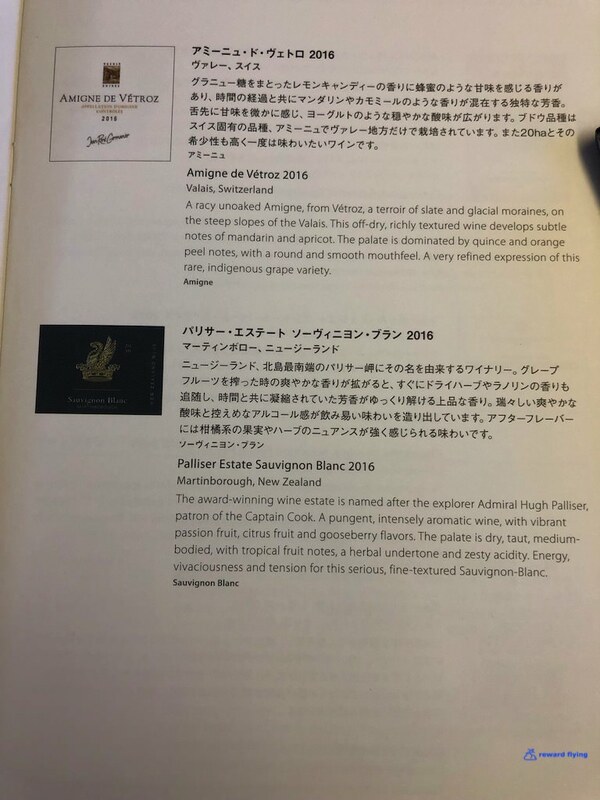 I’m by no means a connoisseur but I would have expected a Bordeaux from France or a Cabernet from the USA. Ironically there was a documentary on the IFE about how they select their wines. It’s a pretty lengthy process and they examine hundreds of different wines. While I’m sure cost factors into their decision (this Canvasback retails for around $35), the wine still has to “pass the smell test”. Another test of a decent wine is how you feel the next day after too much of it and in this case, 12 hours in the air. Canvasback passed that test! A little over-sauced but still a nice presentation. And the temperature was the rarest I’ve seen on a plane. The steak was very good. The Cheese Plate was served without request. Another documentary found on the IFE was about the history of their famous Suntory Whiskey, Hibiki. And the 17 year old version happens to be on the menu. While not a hard liquor drinker, and when I did it was scotch. I ordered a glass. The smoothest tasting liquor ever. I’d asked to wait on dessert and then choose the Warm bread pudding along with some coffee. It was the lowlight of the meal. It wasn’t warm, it was more like a muffin. Time for bed anyway. ANA flight 111 departure and arrival times are great. It’s a late afternoon departure arriving early evening in Tokyo, around 8:30PM local time. Then to the airport Royal Park hotel (which is great) for a proper nights sleep before hitting the jetstream again. So the plan was a short nap which was accomplished, I’ll spare the bed photos. Upon awakening it was time for something else. A delicious juice, not too sweet and very refreshing. As well as pre-arrival options. I ordered the Seafood Rice bowl which is kind of a chirashi. It had a variety of seafood including, seared tuna, uni roe (sea urchin), ikura (salmon roe) as well as chopped avocado and tamago (egg omelette). It was excellent. As the old saying goes, when you’re having fun time flies. The remaining menu pages for those interested. This was a last minute change. I’d originally was booked on Korean Airlines but change to this. (Long story.) I used Virgin Atlantic with their incredible 120,000 round trip in first fare. So this flight was only 60,000 points. With all the blogger enthusiasm about this redemption I highly doubt it will be around for long. Gab it now! 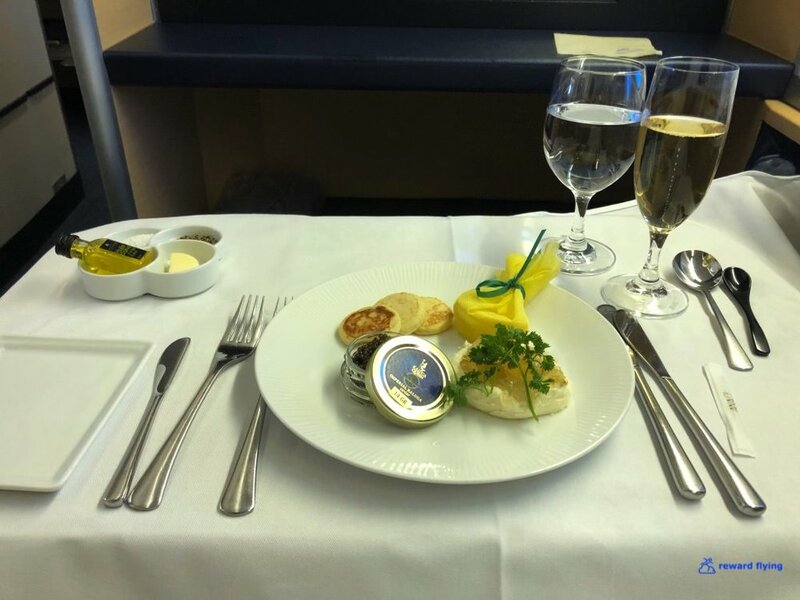 ✔︎ANA’s 8 seat first class cabin has an interesting color combination of blue and yellow. It works. The seats in first are fine. Ad nauseam, the windows are blocked. 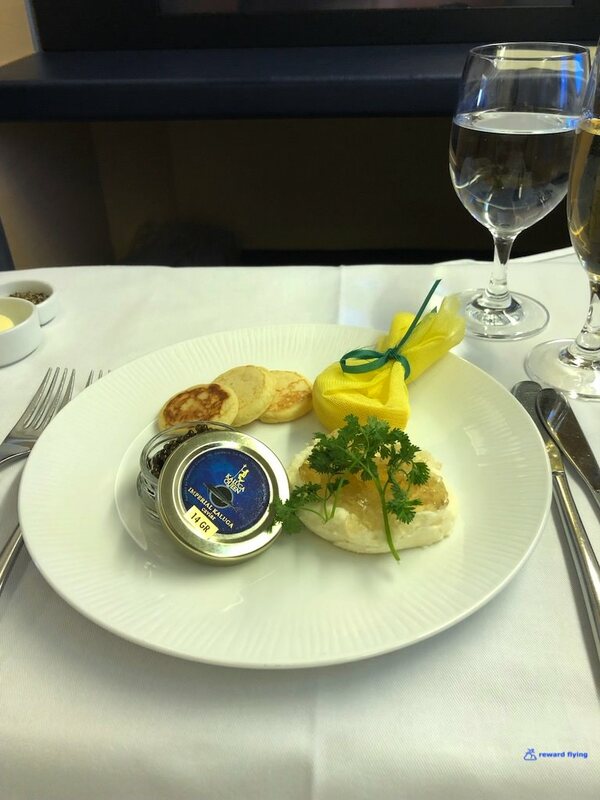 ✔︎There is not much more you can expect on a first class flight than what was received. ANA shines in this category. The food was delicious, ok minus points for the soup and dessert. Everything else was outstanding. And their new PJ’s are much nicer! ✔︎ The monitors need to be refreshed. They are becoming obsolete and difficult to see. Maybe when they were new they were awesome, but not anymore. However the content is good as is their airshow. I didn’t connect to the WiFi as my luck on WiFi planes is basically zero. ✔︎The crew was great. As mentioned not over the top great, but I’d take this crew any flight any time. ✔︎Boeing 777-300. 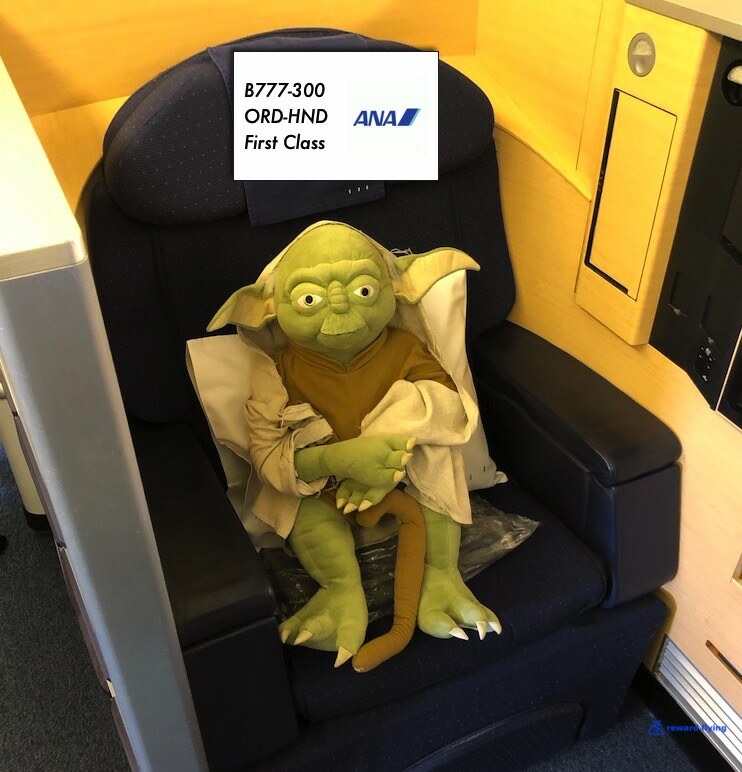 While typically I wouldn’t give a triple seven such a high rating because these are getting old, which is incredible to me having flown United’s first 777 over 20 years ago, but this was Star Wars BB-8. And Yoda along was a great neighbor! This was a great flight, 8 rating. I love ANA!